In order to use a GnuPG key on a smartcard or Yubikey, a GnuPG key needs to be created. This post will show you how to create a GnuPG key with sub-keys for signing, encryption and authentication. The authentication key can be used later on to authenticate via ssh as well. Before the key can be generated, first you need to configure GnuPG. The following settings are suggested before creating the key. The settings contain the documentation from the official GnuPG documentation. Add these settings to the “gpg.conf” file located in the GnuPG home directory. This is either the “~/.gnupg/” or the directory specified in the “–homedir” parameter. # Assume that command line arguments are given as UTF8 strings. # for new keys and becomes the default for "setpref" in the edit menu. # signatures you make, or quite possibly your entire key. # GnuPG 1.4.10 (release 2009) supporting SHA-2 algorithm, this should be safe. # iterates the whole process a number of times (see --s2k-count). # encryption. The default is SHA-1. # --s2k-mode is set to the default of 3. # beginning of the key ID. # command is given twice, the fingerprints of all secondary keys are listed too. The “cert-digest-algo” and “digest-algo” also contain a personal explanation why these settings where chosen even if they are supposed to break the OpenPGP specification. The last settings in the above example are options influencing the way the keys are shown in the output of GnuPG. It is widely suggested to use the long keyid format to identify the keys. The keyid is a short representation of the fingerprint. The long format takes the last 16 (instead of 8 in the short format) characters from the fingerprint. To be really sure to have the correct key, the fingerprint is the information to use instead of any shortened version of it. With the configuration in place, the master key can be created. The master key will only have the capability “Certify” and is only needed when the key is modified. When OpenPGP 2.x is used, the program itself is called “gpg2” in many distributions but also the option to generate the key has changed to “–full-gen-key”. If the option “–gen-key” is used with gpg2, many settings described in this example can not be selected. The above will generate a 4096 bit key which will be used as a master key. The parameter “–homedir ./gnupg-test/” defines the directory used for the keyring to be generated. This is the directory where the previously created gpg.conf file should be located. I suggest to use a removable storage like a USB-Stick to store the master-key on. The master key is not used in every day operation and should be stored in a safe place. Generating the random data needed for the key generation might take a long time. To speed up the process, use the rngd(8) to feed random data into the random number pool of the kernel. This can be done by installing the rng-tools package. To verify the generated keys, execute the following command. According to the view options in the gpg.conf configuration file, the output shows the long keyid format as well as the fingerprint of each key or subkey. To ensure that only strong algorithms are used, set the preferences for the key using the “setpref” command. Before starting to generate the different sub-keys, verify the maximum size of keys the smartcard can store. The Yubikey NEO can store keys up to 2048 bits while the Yubikey 4 can store keys up to 4096 bits. Smartcards usually support different sizes as well like 2048, 3072 or 4096 bits. To add a subkey, the master-key needs to be opened for editing. The following command will open the key specified (in the following example via key ID) for editing. To be able to create all the different key types, the “–expert” option is used. 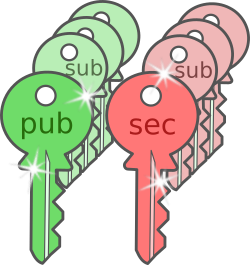 With the key opened for editing, the sub-key can be added to it. To start the guided process of creating a sub-key the command is “addkey”. After the passphrase is entered, the type of sub-key must be entered. For a signing key, the “(4) RSA (sign only)” is used. The key size should match the size fitting on the smartcard or Yubikey. While GnuPG version 1 will ask for the passphrase at the beginning of the “addkey” procedure, version 2 will ask at the end of the creation process for an individual passphrase for the new subkey as well as for the passphrase of the master key. The output above now shows an additional sub-key for signing (“usage: S”). If there is no additional sub-key to be created, the process can be ended by the command “save” to store the modifications to the key. An encryption key can now be created in the same way as the signing key just by selecting the “RSA (encrypt only)” key type. When the GnuPG key should be used for authentication, an additional authentication subkey needs to be created. Such a sub-key can be used to authenticate when connecting via ssh. To create such a authentication sub-key, the type “(8) RSA (set your own capabilities)” needs to be selected. The type (8) allows to set the capability manually. The list above shows the available capabilities. The default assigned capabilities as shown are “Sign” and “Encrypt”. Disable the default capabilities by entering the related letter followed by ENTER one capability after the other. The use the toggle “A” to enable authentication capability and proceed with “Q”. As the last output shows, the master key has 4096 bit and the 3 subkeys have a different sizes to fit later on to the smartcard or Yubikey. If necessary, more identities can be added to the GnuPG key. To do so, the key needs to be opened again in edit mode. The “adduid” command is used then to add an additional identity. The last output after adding the identity shows the key with a trust of “unknown” which will change to unlimited after saving the new identity with the “save” command. The “.” at the identity marks the primary identity for that key. As shown above, after adding the second identity, the added identity is selected as primary identity. As of this, the primary identity has been manually defined by selecting the primary identity using the “uid” command followed by the “primary” command to set that identity as primary. To backup the keys, export them into a file. Exporting the keys is done in two steps, the private keys and the secret keys are exported separately. With the first command, all secret keys (master + subkeys) are exported into one file. The second command will export all public keys (master + subkeys) into another file. Those files can be used to backup the created keys. To export only one particular subkey, the subkey ID can be specified with an “!” exclamation mark at the end of the key ID instructs gpg to only export this particular subkey(s). $ gpg --homedir ./gnupg-test --export-secret-subkeys --armor --output secret-subkey_sign.gpg 0x1ED73636975EC6DE! The above command will export only the signing subkeys secret key. The gpg man page describes the exclamation mark at the key ID like this. When using gpg an exclamation mark (!) may be appended to force using the specified primary or secondary key and not to try and calculate which primary or secondary key to use. For everyday use, you want to “remove” the master secret key from the keyring. This is sometimes refered to as a laptop keyring. Such a keyring can be prepared in multiple ways. By exporting only the secret subkeys, deleting all the secret keys of that key from the keyring (which includes not only the master key but also the subkeys) and then reimporting only the secret subkeys. The above command will export all the secret subkeys of the given key ID and stores it in the given output file. Version 2 of GnuPG will ask for every secret key/subkey to be deleted. At this point, the delete operation for the master key can be accepted but the deletion of the subkeys can be denied. This will result in a error message for the delete operation which indicates that the subkeys where not deleted. This allows to delete the secret master key but keep the subkeys and therefore does not require the reimport of the secret subkeys. After the above command is executed, all the secret keys are removed for the created keys. With the following command the exported secret subkeys are reimported back to the keyring. If the keyring you used to create is not the keyring you intend to use for every day use, the backup files created earlier can be used to create the daily use keyring. This is the prefered method if you have created the key not on the computer you are using for everyday tasks or you have created the key on a USB drive or similar. As with the first option, an export with only the subkeys has to be created with the command above. Additionally to the following commands, I suggest to also copy the gpg.conf used in the keyring to create the key to the daily-use-keyring. The above command can be used to import the public key into the keyring you use for everyday use. With the command below, the secret subkeys, without the master secret key, can be imported into the daily use keyring. The “–homedir ~/.gnupg” can be ommited if the keyring is at the default location like in this example. To verify that only the subkeys secret keys have been imported back into the keyring, execute the following command. This command will list all secret keys. The master key is marked with a hash character “#” indicating that the secret key is missing – as expected. Finally keep a backup of the secret keys, in particular the secret master key, and remove any other temporary export file of the secret subkeys not needed any more. Consider using the shred(1) utility to securely delete those files. As always, verifying the result is important. Thankfully, there is a tool to assist with that. The hkt (hopenpgp-tools) provide exactly that. The utility does not come pre-installed but can be installed directly from the repository of Ubuntu / LinuxMint. So far it seems hopenpgp-tools is not available as rpm for RHEL or CentOS. The hopenpgp-tools can be used to check the key for hopenpgp-tools setting. The command below uses the “hkt”, which is part of hopenpgp-tools, to extract the public key from the keyring. As well, a hopenpgp-tools utility called “hokey” performs the check of the key settings. The green sections show where the best practice is fulfilled. If a setting would not be according to the best practice, the utility would mark it red. hokey comes with ABSOLUTELY NO WARRANTY. This is free software, and you are welcome to redistribute it under certain conditions. hkt comes with ABSOLUTELY NO WARRANTY. This is free software, and you are welcome to redistribute it under certain conditions. Another way of checking the generated GnuPG key is pgpdump. This utility will not interpret the key information and mark any information considered not good practice but will show you the raw key information. On the other hand, way more details about the key itself are revealed. The pgpdump utility is also not preinstalled but can be installed directly from the repositories of the distribution. While the “hopenpgp-tools” utility is not available as rpm package, pgpdump is available as rpm for RedHat and CentOS. The pgpdump utility takes a secret key export as produced from the backup and dumps all of its information in a human readable format. The below command shows grouped information for the master key and the subkeys. The first block contains the details about the secret master key. The highlighted area in the first block shows the s2k settings defined in the gpg.conf. The above shows as well that this key is a 4096 bits RSA key. The first block is followed the the identity and its signature. This shows clearly the self signature of the identities from the master key. In the signature the hash algorithm SHA512 as well as the preferred algorithms as defined in the gpg.conf and the key itself can be found. Following the master key and the identities, the secret keys can be found. The first is the signing key with a size of 3072 bits. The signing subkey has two signatures, one from the master key and one signature from itself (self signature). The signature itself can be identified by the “issuer key ID”. Sig type - Primary Key Binding Signature(0x19). The encryption key as well as the authentication key only show one signature from the master key. As their capabilities do not include signing, they are not signed by them self. Even if it is not as comfortable to use gpgdump as it is to verify the key with hopenpgp-tools, there are more details that might be of interest. Additionally, for RedHat / CentOS and other rpm based distributions it offers a good alternative to the hopenpgp-tools. This entry was posted in Encryption, Security and tagged authentication, encryption, gnupg, gpg, pgp, signing, subkeys. Bookmark the permalink.